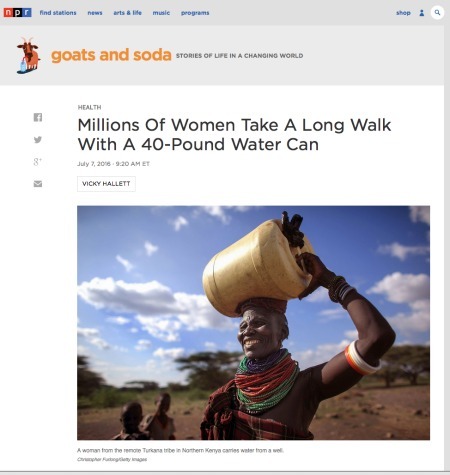 Sociology professor Ben Crow discusses his research in a recent NPR piece about how women bear the brunt of collecting water across sub-Saharan Africa. In a recent NPR story, sociology professor Ben Crow discusses his research about how women bear the brunt of collecting water across sub-Saharan Africa. "The path to the water source may change frequently, adds Ben Crow, a sociology professor at the University of California Santa Cruz, who has researched the intricacies of water collection in Kenya. For one study, he placed GPS units on jerry cans to learn where and how far from home women traveled." Crow has done extensive research on conflict and cooperation over international rivers in South Asia. He is the co-author of the Atlas of Global Inequalities (University of California Press. 2011). His current work explores how poor women, men and children gain access to water in urban slums in the global south, with a focus on cities in Kenya.